For the past three decades, Business Mastery has served as a trusted guide for people seeking to live their career dreams. It is specifically designed to support readers on their journey to a fulfilling and financially rewarding career. In the pages of this innovative, time-tested book, readers will find everything needed to launch and effectively manage a thriving practice. It also includes practical tools and tips for how to market one’s skills, work smarter, develop alliances through networking, fine-tune communication skills, and increase profits. The 5th edition is completely updated and includes new information about the psychological aspects of purchasing, the purchasing cycle, how to effectively build an online presence, and tips on how Internet marketing can boost business growth. Business Mastery is filled with resources to help readers stay balanced, increase their client base, get organized, clearly define goals, and, most importantly, keep doing what they’re passionate about while creating an excellent income stream. Developing business savvy is key to success—whether working for someone else or being self-employed. 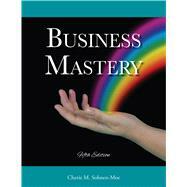 Whichever path is chosen, readers can count on Business Mastery to help make their dreams a reality.